On Wednesday I hit the McDonald House Sale and walked away with darn fine goodies! In fact, I had such great luck, I decided to go back for a second round on Thursday for more stuff. Now, I know what you're thinking. Chad, why would you go a second time (Let alone third and fourth? More on that in the next coming days.). Well, with a building that's normally used as a warehouse, there's always more stuff being added to fill up bare shelves. Plus, my fiancée went with me, so having a spare set of eyes was more than useful in an otherwise already familiar situation. Personally, with the exception of a few items I wanted to save for clearance days, I thought I had seen them all. So to have Laurie with me, was an extra help. 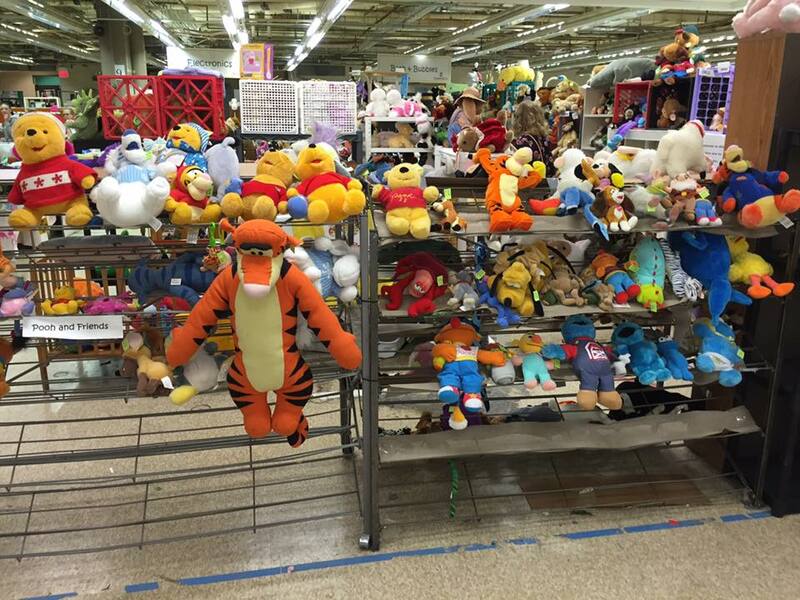 Isn't that Tigger awfully frightening in that pose? Almost like he's possessed. It's a good thing she came with me, too, because the second day was even more of a success! Keen! I love keychains just as much as I love buttons! Good way to start off the day. 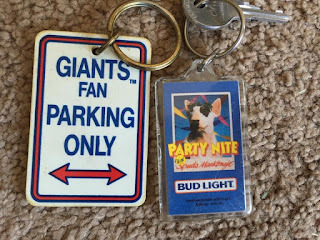 Spuds MacKenzie was a huge advertising icon of the 1980s. SHE, yes she as they discovered well after the commercials portrayed her as a male, was the Joe Camel of beer. She'd mainly just sit on a set and have a bunch of hot babes around her and then kinda look over to the side as if she was bored. A nice 80's addition to my keys since one of my coworkers accidentally broke my California Raisins keychain while throwing my keys to me. Rude. 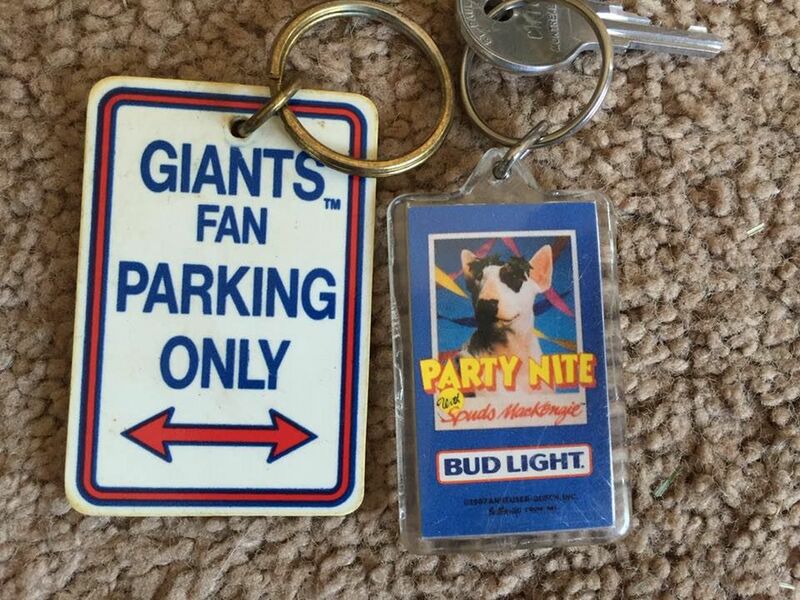 The Giants keychain is for my best friend of 27 years who has been a lifelong Giants fan. It's nice looking though! I dig it! Small but still admirable. What am I to find next? OH YES. DO YOU SEE THESE?!?!?! Since it is a sale closely associated with McDonalds, you're guaranteed you'll to see plenty of McDonalds merchandise. I expected that much. They have sub-sections in every department just for McDonalds stuff. What I was not expecting was to find these amazing holiday themed plates. First off, we got two of each plate. The other two are currently in the dishwasher. Second off, I am a HUUUUUUGE McNugget Buddy fan, as is Laurie. I'm a firm believer that when it comes to Halloween memories, they're up there as some of my favorite representations of the holiday. I mean, one look at that plate and you'd tell me you'd leave it behind? Rubbish. You'd pull a Bobby Heenan and sell your own grandmother for one. It's a perfect illustration of Halloween! In fact, I dare say I won't need another Halloween decoration ever again. 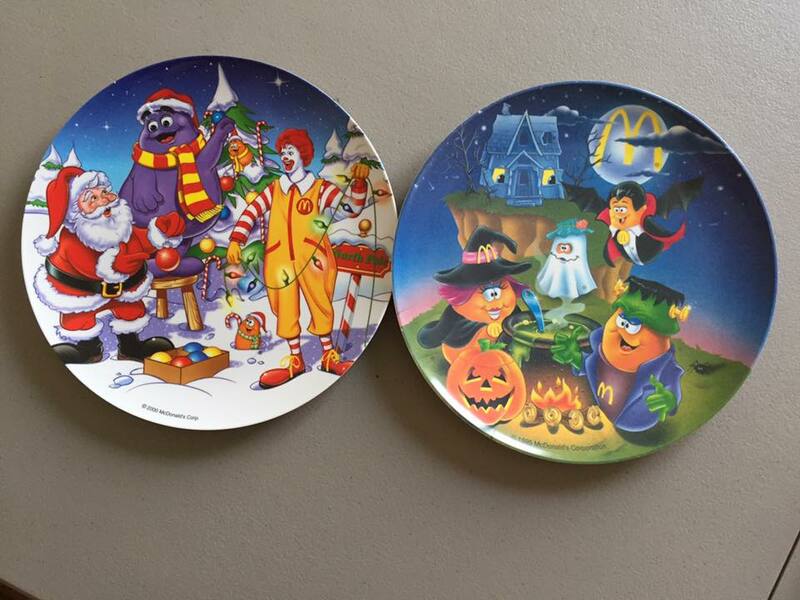 The Christmas plate is a nice one, but admittedly, not as eye popping as the Halloween offering. I like it. I do, but Laurie fell in love with the McNugget in the tree. I couldn't stop at her at that point. It was all over. It was like Bret Hart putting me in the sharpshooter and then me tapping out. I eventually submitted to it's adorableness. How could I not? I mean look how happy everyone is to decorate the tree with Santa. I mean, you couldn't get much more Christmas-y unless you woke up Christmas day and Santa, Frosty, Charlie Brown and Garfield were all sitting around sipping hot chocolate and enjoying Christmas cookies. This is a solid Christmas piece. In fact, I'm tempted to just keeping it up all year round.I mean, sometimes I get reminded that I love Christmas, so it wouldn't hurt. 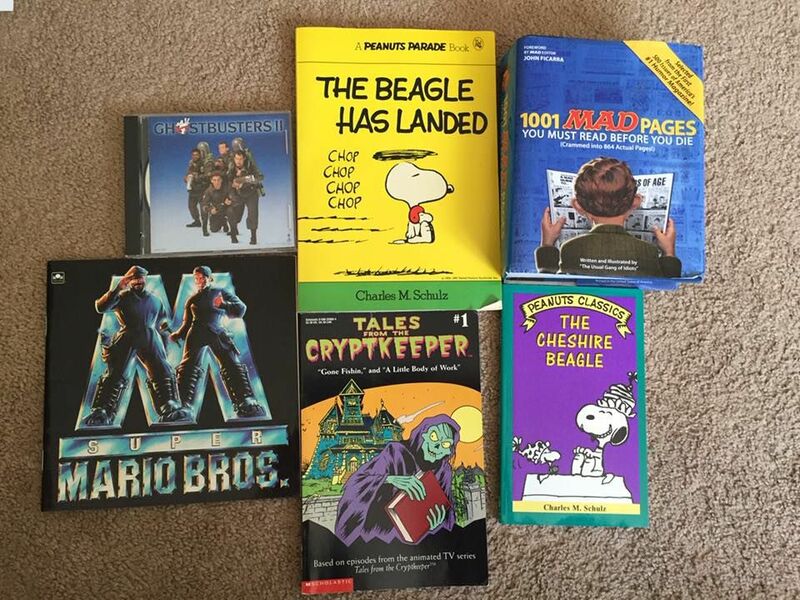 I get the sense if you look at these, you'd think a first grader invaded the local used book sale. Actually, this resembled my kinda haul even back then. I mean, any Peanuts book I see, I must own. It's plain and simple. I love Snoopy and the gang. I just do and my book collection has been growing in the past few years. Eventually I'm going to need an entire bookshelf just for these. Challenge accepted. The Mad book is something I downright had to have. I gave my nephew my entire collection of Mad Mgazines years ago, so to find this almost "best of" was a perfect replacement. Tales From The Cryptkeeper something I never liked. I was always a bigger fan of the live action show, so when I first saw the cartoon I kinda scoffed at it, even in third grade. But as a fan of the Cryptkeeper, I just couldn't allow myself to pass it up. It's pretty neat and has plenty of pretty pictures! The book is just a picture book and for some reason I simply couldn't leave it behind. It just looked pathetic all by itself. Not pictured: Laurie's Mindy Kaling book. Laurie loves Mindy Kaling and any funny human, especially funny ladies, so in addition to Tina Fey, Amy Poehler and Sarah Silervman's books she had to own this as well. Mindy is a funny woman, so I can't say I blame her! And not a bad bargain for 1.25 grouped together with a bunch of crappy kids books. Ok, that Ghostbusters 2 soundtrack. I love Ghostbusters 2. It's my favorite of the two and it has such a fun 80s soundtrack. Bobby Brown, Elton John, Doug E Fresh, New Edition and Oingo Boingo are just some of the names included. And yes, the Ray Parker Jr. song is included! Awesome! You're eyes do NOT deceive you. 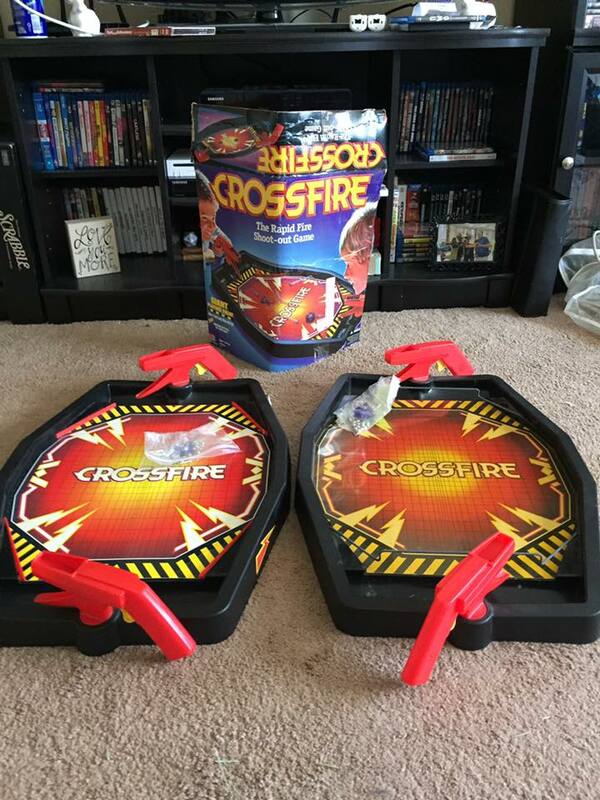 Two Crossfire games, one even came with the box. This is quite exciting. Even better, it was practically stealing them. Two for the price of just a fraction of what one would go for on eBay. This was a no brainer. They were coming with me. I still can't get over that one of them had the box, as bad a shape that it's in. 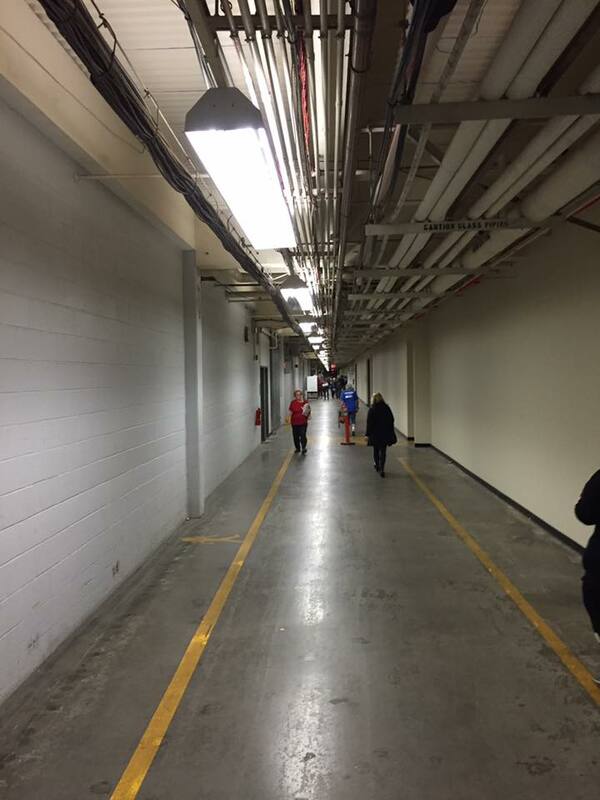 Apparently the volunteers just threw things in bags and hoped for the best. I'm guessing it's like monkeys in a factory throwing things in random directions. Truth be told, I hadn't played Crossfire since I was a kid. A friend of mine had it and it seemed a little bit more exciting back then more than they are now. I don't know if the bead guns are getting up there in age, but it just didn't shoot as rapid as it probably once had. But I didn't let that ruin my excitement. This is an essential piece of 80's toy history. A must own game. If you were lucky to own this, you'd be king. I mean anyone who had this also had Fireball Island, most likely. And if you had these two, you were untouchable. Rainy Saturday's would no longer be a bore. No sir, you owned the gold standards of games. Plus, you simply can't forget that awesome commercial. It was the most intense commercial we had seen up to that point. It made you honestly believe you could damn your opponent for eternity all because they lost. This commercial was presenting a game of life and death, so therefore, we HAD to own it. Check it out below! So all in all, it was a darn fine day for purchasing other peoples unwanted crap. But the next two days...that's where things got intense. The war has reached a fever pitch and I've only just begun.